1-Sony ad from 1965 promoting "Solid State" components and 4-Track Stereo recording. 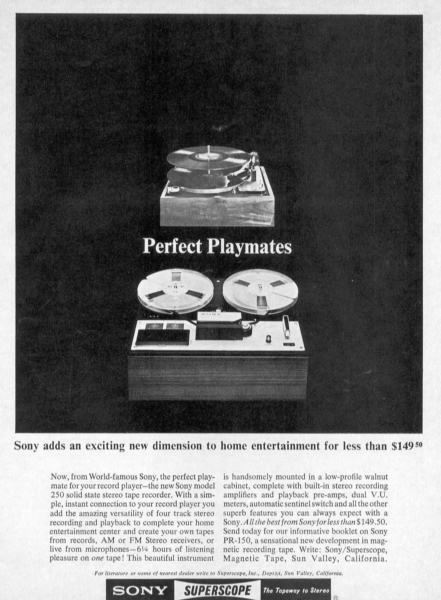 Ad states you can "Create your own tapes from records", and boasts of having "6 1/4 hours of listening pleasure on one tape"
3-Sony "Quadradial" recorder featuring 4 speakers. Range 40-15000 Hz. $-Track for $399.50! 4-Sony early Video recorder, the leader at that time for Home recording and the use of VHS scanning. Recorded 60 min. on a 7" tape reel. Had 9" monitor.